Photo order is left to right. Options: View report with larger photos; Click any photo to enlarge. Also see: maps of San Tomas (Master Plan map and aerial map) that clarifies this pictorial report. Back to San Tomas Expressway main page. 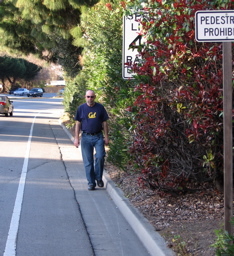 Lafayette Street: There are usually no sidewalks north of El Camino, despite the 40 mph speed limit. ... or a dirt path. The width of this path is between 1 and 2 feet. 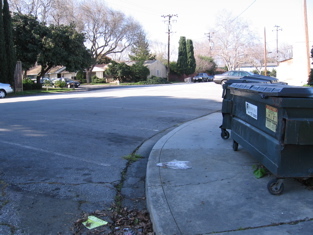 Compare with 2-foot wide concrete "gutter pan" just to the left of it. 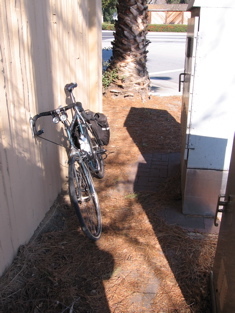 Therefore, 2-foot wide dirt paths are sufficient and cheaply created for San Tomas. 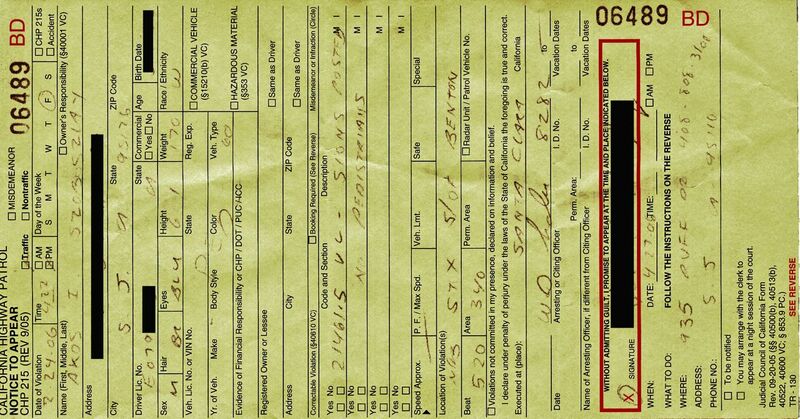 They are also required by County policy where-ever it would be unsafe otherwise --but County staff refused because that would "encourage people to violate the 'pedestrians prohibited' signs." 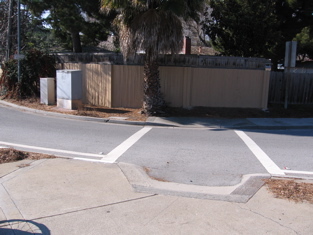 This San Tomas intersections (at Scott) has a smaller radius corner, the current practice that is safer. 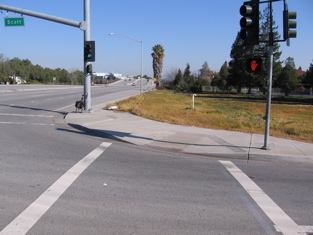 Most of Montague, the newest "expressway" has similar corners, but older parts of San Tomas have large radius turnings, which is risky for walkers crossing the road. 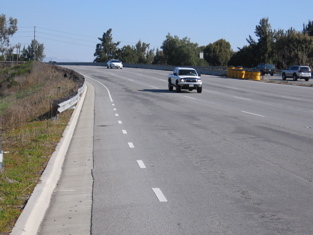 Sidewalk continues along San Tomas Expressway, crossing bridge over 101 (shown, looking north). San Tomas bridge over Caltrain has a "wide shoulder" but can easily be widened to not intimidate walkers. 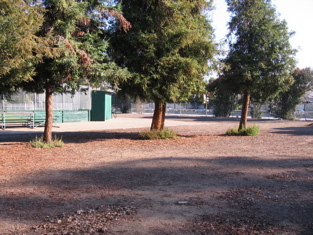 In 2007, the new Creek Trail will be parallel and walkers will no longer walk here. Until then, people use the bridge. The top of the bridge, on this (west) side, has a 6' wide shoulder. 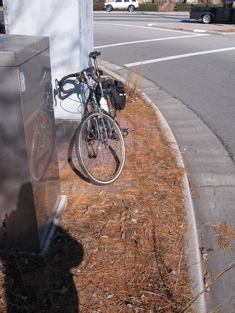 Shoulder above is 5' wide, a "wide shoulder" according to County Expressway Master Plan and safe for walkers and bicyclists. 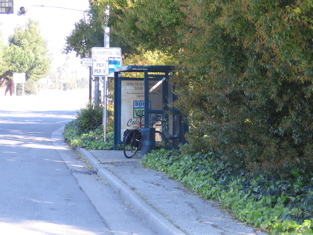 Sidewalk or dirt path needs to continue beyond this bus stop. (San Tomas @ Cabrillo, NE side). 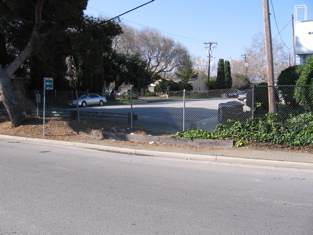 Walking route can go thru school grounds, north of Raggio Ave.
An existing paved path through the yard already exists, but is about a block away. 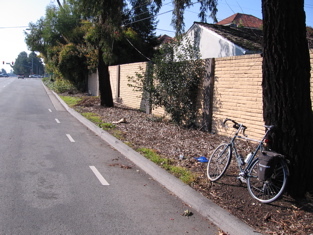 Los Olivos Drive was the prior name for San Tomas in this portion. 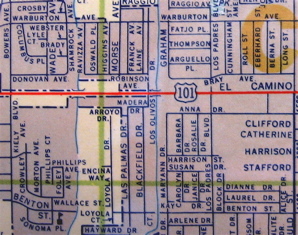 Map is from 1950s. 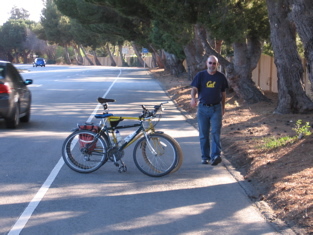 Los Olivos Dr. crosses U.S. 101 (El Camino) near the Creek. 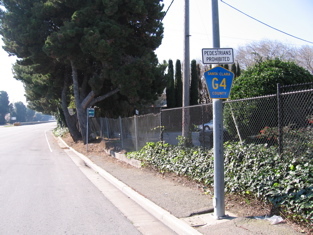 Street, Los Olivos Drive, was walled off and the name was changed to San Tomas Expressway, a 45 mph arterial road. 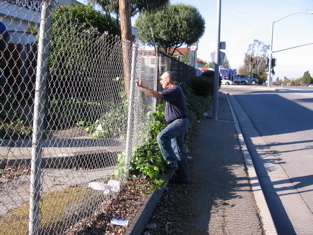 Open the wall near here and create path along San Tomas to El Camino (at signal). 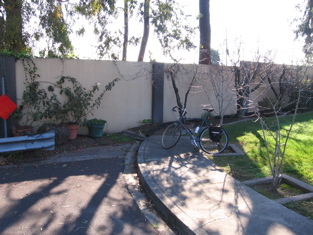 ... access to street is fenced off. 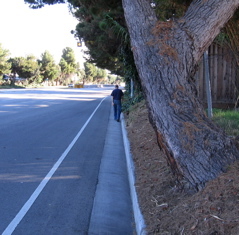 Madera Dr. (shown) and Blackfield Drive (next left) would make a more pleasant walking route than San Tomas. ... the sidewalk on the other side. The two sidewalks almost connect. Open the fence and remove the garbage bins from the sidewalk. 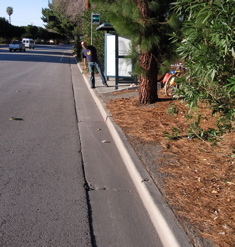 Man using wide shoulder (beyond bus stop) is safe, but parallel route is more pleasant. or (c) create path behind boxes. 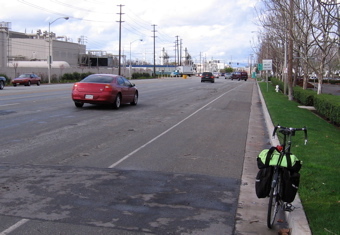 Beyond the"intersection area" the shoulder is so wide (9') that it will hold lengthwise bicycles plus walkers. 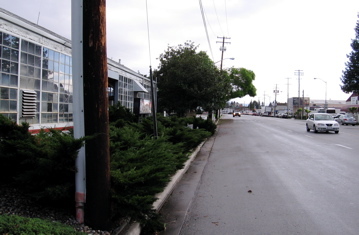 Path to bus stop needs to be extended beyond intersection. 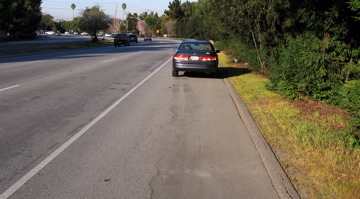 Beyond the bus stop, create path until 9' shoulder is reached. The reason for creating a path is that this is still in the "intersection area" which is diamond shaped. This is required by County policy to increase safety. Policy was originally adopted in 1991 by the BOS at the request of MTS. 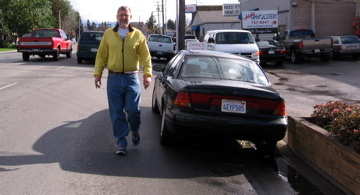 There is plenty of room for walkers if there is room for a car. Car had stopped and people got out to change drivers. Same location as the stopped car, which I just took a picture of. 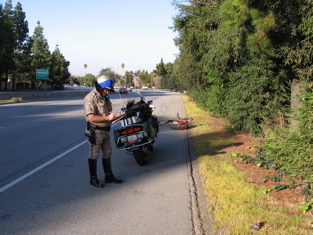 Apparently, it is safe for the CHP to stand in the middle of the 9-foot shoulder. 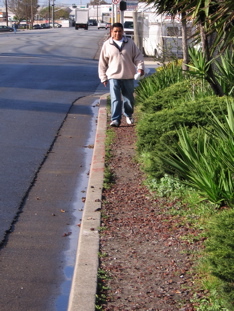 In contrast, walkers always walk on a shoulder at the edge of pavement or in the gutter pan. Also see: Expressway topics, links page.